Cynthia Faison accepted Christ as her personal Lord and Savior in 1991 at Bethany Baptist Church in Somerdale, New Jersey. She began serving the Lord as a volunteer in the church office, assisting with the development of the bulletin and other essential office duties. In January 1993, the Lord opened the door to full-time ministry, and she became the Administrative Church Secretary. Her position and responsibilities have evolved and been further developed over the years with the increase in membership, ministries, and outreach events. 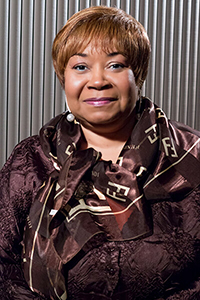 She presently serves as the Administrative Ministry Assistant to Bishop David G. Evans. In an effort to further enhance her communication and interpersonal skills, Cynthia is enrolled in the Abundant Harvest Bible Institute in the Biblical Counseling Track. Previously, Cynthia attended The Bradford School of Business in Philadelphia, where she obtained an Associate Degree in Secretarial Sciences. She has held several positions with Fortune 500 companies, where her professional, interpersonal, secretarial, and managerial skills were highly developed. She now knows that the Lord was preparing her through all these experiences to serve Him and His people. Perceiving her position at Bethany as a ministry rather than a job, Cynthia counts it all joy and delights in serving God by serving His people. Cynthia resides in Washington Township with her teenage son LeMar Terrell.